If you’re looking for a funky and fresh wedding design that incorporates wonderful geometric design, beautiful colours and a minimalistic modern style, look no further than the Chevron wedding invitation! Including everything your guests need to know and leaving out anything that’s not important for a minimalist feel, this awesome design showcases your wedding for exactly what it is – the wedding of the century, nothing more, nothing less! Perfect for a spring, summer, autumn or winter wedding, this fun, modern design can be tweaked and customised to suit your big day perfectly. Professionally printed onto the highest quality 300gsm card, you can be certain that your wedding suite from Russet & Gray will provide a delightful and impeccable sensory experience for all of your guests, both young and old. We understand that simple and elegant style needn’t stop at merely inviting your guests, so that’s why this wedding suite includes Save the Dates, RSVP cards, Orders of Service, information cards, table numbers, menus, table plans, place cards and Thank You cards, so you’re free to maintain continuity and effortless style throughout your wedding celebrations! Not certain on the wording? No problem, just tell us how you’d like to personalise each element of the wedding suite and we’ll work with you until it’s absolutely perfect, just the way it should be! So what are you waiting for? 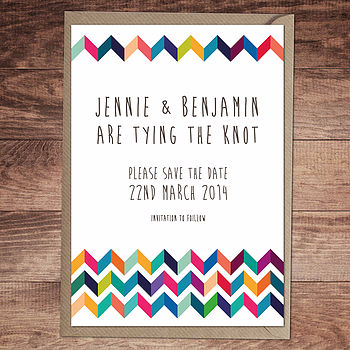 We’re sure your guests are itching to receive their wonderfully colourful Chevron Save the Dates and wedding invitations!